I’ve always been fond of Jericho Guitars’ extended-range guitars, but what fascinated me most is that they regard a 25.75-inch scale length to be the proper scale length for all six-string guitars. Compare that to Gibson (24.74-inch) and Fender (25.5-inch). Jericho’s standard scale length provides an ideal marriage between intonation and string tension, especially for many modern players who down-tune regularly. I asked the gang at Jericho Guitars to explain the reason behind the 25.75-inch scale length. Their response was, “What you get with the slightly longer scale is a truer source signal. Traditional and modern forms of amplification, like impulse responses, benefit from the extra harmonic content provided by this scale length.” Considering that, I believe Jericho’s Fusion Walnut EverTune might be the best guitar for today’s players who gig and record consistently. The combination of Jericho Guitars’ standard scale length and the inclusion of the EverTune Bridge makes it nearly impossible to play out of tune, regardless of the tuning you choose. More traditional players shouldn’t feel left out since the Fusion Walnut Evertune’s aesthetic and sound will also appeal to the classic rock and country crowd. FEATURES It’s immediately apparent the Fusion Walnut Evertune blends two classic guitar designs in its appearance, but what’s even more noticeable is the outstanding fit and finish. The guitar features neck-through-body construction with a three-piece mahogany neck, flanked by two gorgeous slabs of solid walnut for its body and a very thin semi-gloss finish that almost feels matte. The ebony fingerboard features block inlays, medium jumbo frets and a super-flat 17-inch fretboard radius. It’s the first Fusion model that comes with a factory-installed EverTune bridge, a revolutionary spring-designed bridge (and saddles) that delivers precise intonation and keeps string tension intact despite temperature and humidity changes. 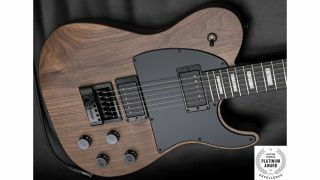 The guitar’s striking looks are further enhanced by black hardware, which include Grover locking tuners, a GraphTech Black TUSQ XL nut and custom black covered Seymour Duncan JB (bridge) and ’59 (neck) pickups with push/pull “coil-splitting” on both tone knobs. PERFORMANCE The Fusion Walnut Ever-Tune has a firm response and balanced tension. I attribute this to its scale length in concert with the EverTune Bridge, which contributes a tactile elasticity where you feel more in control and connected to the instrument. Even more stunning is the way the EverTune Bridge compensates for intonation, where every fretted note and chord sounds perfectly in tune, regardless of the amount of pressure applied. Also, the slim, flat C-shaped neck profile is uniformly contoured, making your hand literally glide across the whole neck. The guitar is dense and dark sounding, which perfectly complements its brooding aesthetic. The JB and ’59 pickups are a great choice here, offering defined tones without being overwhelming, and combined with the coil tapping, further expands your tonal options to craft many shades of vintage and metal tones. For the guitarist who relies on precise intonation and full-bodied sound, the Fusion Walnut EverTune is an absolute must. ● The EverTune Bridge keeps intonation and tension spot-on, despite the amount of pressure you exert on the fretboard. ● The Seymour Duncan JB and ’59 pickups provide a great array of fiery output and vintage burn, with even more flexibility if you use both coil taps. ● THE BOTTOM LINE The Jericho Guitars Fusion Walnut EverTune combines flawless intonation and playability in a guitar that’s tailor-made for any player who craves focused, dynamic tone.